DA42 Twin Star – elegant shape and modern technology are joined in this beautiful twin. At last – Alabeo… introduced a proper DA42 to FSX and P3D. What I like in Alabeo’s Twin Star? What I do not like in DA42? What am I dealing with? 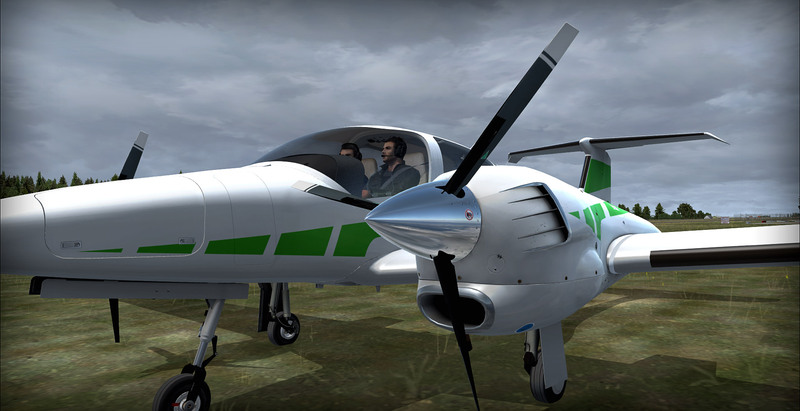 DA42 is a modern, twin engine plane made of carbon composites and powered by diesel engines (in the version recreated by Alabeo). This means that this 4-person plane is even more efficient than the usual Twin Star. Unfortunately – this means that it’s also a little under-powered (compared to other Twin Stars – in comparison with earlier twins DA42 performs well). Twin Star is certified for IFR flights (up to 18,000ft if a pilot took oxygen bottles) and for FIKI – Flight Into Known Icing conditions. Contrary to it’s luxurious image – it’s capable of landing on grass and other unpaved surfaces, but you should avoid rocky runways – carbon composites are not as easily repaired as a dented aluminium. This version does not like winter conditions also – read the checklist to know the minimum temperature of fuel before you start your engine in freezing temperatures (not simulated – in FSX/P3D you can run these engines in all conditions). It is the third payware DA42 that I try in FSX. Eaglesoft’s made the first one – I bought it and even liked it (it was my of my first payware planes) but I forgot about it soon. It was heavy on my system and textures were below my expectations. Later I bought IRIS. Much better inside, worse on the outside. It performed better (in terms of FPS) and worse (flight model). I did not use it often. When I tried Alabeo’s DA42 in FSX for the first time I thought that Twin Stares are cursed. For nearly two months this plane stood in a hangar and I flew it 3 times on the first three days. I wasn’t that fond of it in the beginning – I had some doubts as to it’s performance, systems and flight model. Recently I read a few articles on DA42 and I gave this add-on another chance. It surprised me! I know that I will keep this one! 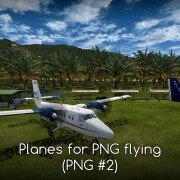 You can buy this plane at Alabeo and Carenado websites. It is also available at popular fs-add-on shops. It’s $34.95. Installation is automated. Serial number is required. There are several documents – people who had no experience with glass cockpits and fsx autopilots may find them useful. Others… can skip most of them and go straight to the checklists (Normal Procedures). If you do not know how to operate a glass cockpit – Alabeo’s G1000 manual is really helpful. It’s still a default G1000 but completely redone by Carenado/Alabeo – and this makes a difference. So – when in doubt – look into this manual. Performance tables include only a single table – cruise speeds. It’s time to enter cabin. This is a really well designed interior! The 3d model is very impressive – with nearly all features modeled in 3d. Even circuit breakers panel is three dimensional. Instruments (all three of them) are also 3d – if you look closely you will see that all needles have some depth. Nearly all switches and knobs in this cockpit are clickable. Red switches of alternate power for the artificial horizon and alternate anti-icing mode are the only exceptions (probably because of the protective frame that covers them). Why I rate it with 4* if I like it so much? Unfortunately this cockpit follows the usual Carenado/Alabeo pattern of reusing old models. All G1000’s buttons are flat. Autopilot panel is even older and more obsolete (when compared to the rest of this cockpit). Textures are good – once again the graphical skills of this team show themselves. This is the case of talented developers recreating a beautiful plane. It just had to work! And it did! I adore this plane. I really like to fly in outside view and admire how good it looks. And it’s not only the general shape that is so impressive. Alabeo’s developers did a really good job creating small details. Navigation light on the tip of each wing is simply perfect. Static dischargers are delicate and subtle. Parts of flaps – well defined. Also the smallest details like brakes are designed carefully – I can even notice several screws and parts of disc brakes. There is no manual for this plane. And no cockpit layout. If I needed to look for a switch – I was on my own. Usually it was not a problem – there are few switches here, but… once again someone in developers team did not read the manual they published – there is a point saying “ALTERNATE STATIC SOURCE . . . . . . . . . . check CLOSED”. For some reason I knew where the alternate static source switch/valve is located. Unfortunately – it’s missing in this plane. Some features – like alternate air or emergency gear extraction are not functional. Fortunately the G1000 brings some change in my attitude. When I turned on master switch – G1000 came to life. Slowly! In fact – it booted quicker than the real world G1000, but the delay is a pleasant feature. It also took some time for the system to align itself. Startup surprised me again. I did not expect nuances of engine behavior like in A2A or PMDG aircraft so it was ok when the engine caught at the first turn of the starter but it was good to watch how the temperatures rise slowly. It took a minute or two for engine reading to stabilize. As you can see – the systems work mostly correct. I call them “fsx-correct”. Maybe even better than usually. But still – I would like them to be more close to the real world planes. This plane would be so much better without some simplifications. For example – “Low Voltage” warning shows when avionics are turned off. It should show when alternators are not generating enough power. For example at very low RPM. The same applies to the autopilot – the manual states that it was simplified so that it is suitable for simulator. What I see is just a repacked FSX autopilot. Even worse in some respects (they messed up some features). These are not problems that would take away a pleasure of flying… but it would be nice if these systems worked as they should. Fortunately there are also some features that make this plane stand out from the crowd. I could change V speeds on my PFD. G1000 has an electronic checklist. Engines sound mostly ok, but it is not realistic. Most switches make a sound when you flip them… but it’s always the same “click”. There are no wind or speed related sounds – you can open a window and nothing changes. I like this plane. It’s very good and some features are designed perfectly. Generally – I like the clickspot layout (they are large enough and correctly places). Also the logics of right and left clicking is intuitive and I did not see any exceptions from the rules (like a switch reacting in opposite way to my click – compared to all others). Engine starter is the only uncomfortable switch – it’s clickspot is too small (narrow) and I needed to place my mouse precisely over the key. With the space available – this clickspot could have been much bigger. During my test I found that the plane flies mostly by the numbers. There are no serious mistakes – like too high speeds or significantly different fuel flow rates. It’s not perfect but it’s at the level of most FSX add-ons. Usually it’s just a few knots over or below the limit. The same applies to the fuel consumption. (Actually – the speed is usually a little higher and the fuel consumption is a little lower than specified). If you want to buy DA42 – keep in mind that it’s a modern plane. There is no propeller or mixture management here. The plane also manages cooling and supercharging. That leaves the pilot with only the throttle. 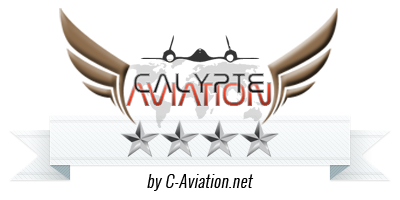 I read a few articles about DA42 behavior in flight before I wrote this review. My first impression was that some elements of it’s flight model are underdeveloped. In some cases I war right. In others (surprisingly) the strange behavior is equally strange in the real world plane. For example – it’s extra-forgiving at approach. It’s almost impossible to stall it if you have 30% or more power in landing configuration (in level flight). That is simulated correctly. These are details but these details divide good add-on from a very good or a great one. Keep in mind that this is a diesel plane. These engines do not produce a lot of thrust. This means long takeoffs and slow climbs. Be prepared for this – it’s simulated well. The last few words about the engines. Carenado/Alabeo developers are not that good in managing engine problems. I never got my engine to feather (it should do so automatically). That brings a pleasant memories of Eaglesoft’s DA42 that handled very well (very realistic) on one engine. Takeoffs may be long but the landings are surprisingly short. Just watch out for the tail strikes – you have a very long and low hanging tail! Landings are made easier by the gear (you can use it as a speed brake – at all speeds!) and flaps that keep the speed low. Also in case of flaps you have a wide range of usable flap settings – “small” flaps can be extended at 137KIAS and full flaps at 111KIAS. This is very helpful when coming to landing from too high altitude or at too high speed. I think that static elements and config panels are very important. For this plane Alabeo prepared several static elements (warning cones, towing device and remove before flight notices. The first panel allows you to add this static elements and also – enables or disables cockpit reflections (can improve performance a little) and to enable fully transparent windows (DA42 has tinted windows in real world). The second panel switches systems between cold and dark and ready to fly states. I was surprised how performance heavy this plane was. I know that the glass cockpit planes are FPS hungry but Carenado/Alabeo glass cockpit gives this Twin Star the weight of a 767 or a 777… I expect much more in a GA plane. Among the add-on planes available on the market Alabeo’s DA42 stands out. It’s a good add-on even if we consider the minor flaws that I mentioned. In some aspects – it’s a great add-on. I fly this plane with pleasure! $34,95 is a good price for such a plane. Cheaper that some top-level add-ons but on par with many that I find inferior.